When the British newspaper, the ‘Daily Mail’ posted a preview article of the Manchester Derby on 12th April saying that the match would feature 14 native Spanish-speakers and nine English speakers, it of spoke a larger problem within English football. The Premier League has recently signed a new TV rights deal with Sky, and is set to break all previous revenue records, with clubs now getting to reap huge benefits out of it. On the face of it, it seems like good progress for English football, but at what cost? The Barclays Premier League has been flexing its muscles for the past 20 years since its foundation. The league has a fan base which knows no boundaries. From Asia, to Africa, to the Americas, you will find fanatics of the league almost everywhere. However, this commercial success does not come without its own on-field problems. The revenue the league generates is nowhere near the dismal performances of England at the last few FIFA World Cups, coupled with a few European Championships. The country that is often thought to have invented that game has forgotten about its roots. Its roots which lie in the great feet of former English legends like the late Sir Tom Finney, and one of his closest compatriots, Sir Stanley Matthews, who graced the football pitch till an astounding age of 50. Those are the former glories which English football can only dream about in present day. When people like Emile Heskey graced the national team for so many years, you knew there was a problem, and it still persists. The national team cannot match man-to-man with any of the other European giants – Germany, Spain. But, why is that so? It is because of the commercial nature of the English game that the on-field problems are often ignored. On a primary level, it is there for everyone to see that the top English clubs lack an intrinsically English identity, and are seen more as by-products of multiculturalism. While that is good for the game in general, it is often damaging to the prospects of many young players. For example, Chelsea have one of the best youth systems in the country, and have 26 players out on loan throughout the continent. This promising statistic is however marred by the fact that Mr. Mourinho is absolutely adamant on using none of them, and buying more and more players to get the short-term success he so cherishes. Another example of this damaging concept is the Manchester derby. The two Manchester giants, as the article from ‘Daily Mail’ points out, have 14 players of Spanish origin between them, and only 9 English speaking players. To add salt to the wounds of football within the country, sub-standard players like Jesus Navas, Eliaquim Mangala, Edin Dzeko, Antonio Valencia, and Marouane Fellaini readily make the cut for the starting lineups of these two top clubs, while players from development squads like Jordy Hiwula, George Evans, James Wilson often are put in a cycle of being loaned out to the lower tiers of English football, ultimately to be sold. Critics say that English players are not good enough. But, don’t clubs have responsibility to develop them? Where does it go wrong? Let’s first rectify that, rather than constantly looking over the borders. A ray of hope is the sprawling new campus that City have built. 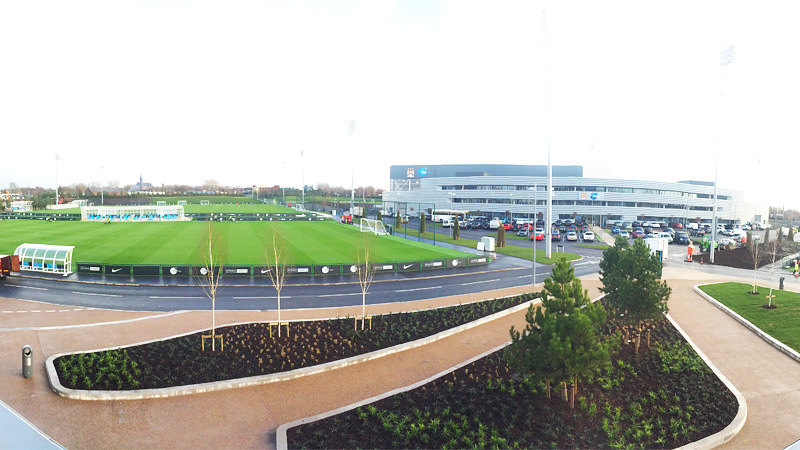 The new campus overlooking the Etihad Stadium is reflective of the fact that City want to follow the “Barcelona Model” of football. Have the best coaches, the best infrastructure and it puts you in the best position to have a good production line of homegrown talent, and you possibly go on to dominate world football for the forseeable future. Simple. Similarly, but operated on different lines is the famed Southampton academy, which has slowly become one of the most profitable academies in the world, and contunies to produce potential world beaters like James Ward-Prowse, Ryan Seager, and Harrison Reed. This problem lies within Spain as well. But clubs there do not have the same financial capacity as the Premier League, (cue the unfair practices of the Spanish FA) and are forced to invest whatever little money they have into the youth academies, so that the costs remain minimal while the benefits have the possbility of being huge. ‘La Masia’ and ‘La Fabrica’ are two iconic names in world football, and they clearly emphasise the model which the two big clubs of Spain can afford to tread on. Real Madrid have players like Ronaldo, Rodriguez and Bale in their ranks, but in the same side they have the likes of Jese Rodriguez, Iker Casillas and Dani Carvajal. Added to this, they can also bank on the great names the academy has produced like Roberto Soldado (Pre-Hotspur days), Raul, Canizares etc – they have, and will continue to produce great players in the world. Furthermore, La Masia has produced one of the best players ever, Lionel Messi, coupled with arguably the greatest generation of Spanish footballers including, Xavi, Iniesta, Puyol et al. Compare this to the great likes of Emile Heskey, Peter Crouch, Paul Robinson and other national team flops that have been produced by the super-sucessful clubs like United, Liverpool, Chelsea, Spurs, City and Arsenal. What does this reflect? Straightforward ignorance by the FA, and the clubs who look at short-term commercial success. Where is the Class of 92? Oh yes. RETIRED. Why doesn’t each English club have a “Class of ‘92?” If this trend continues, the phrase might well be replaced by the “Imports of ‘92. The English FA need not look too far for solutions. The successful model of the German FA, the recent regulations of the Italian FA can be taken as guiding lines. The fall from grace of Italian started along the same lines. Milan derbies used to be a non-Italian affair in the last 20 years. Argentinians, the Dutch, and even the overweight Brazilian Adriano were on show, but Italians were nowhere to be seen. This amounted to great commercial and on-field success culminating into many-a-Champions League, and even a lucky World Cup in there somewhere. But now Italian football is down in the dumps, with Juventus being the only ones flying the Italian flag not so high, compared with the time when the Italian Champions League boat included Inter, Milan, Roma and even Lazio. Recently though, in order to combat the alarming dependence on foreign imports, the FIGC has decreed that from 2016 each club's 25-man squad has to include four homegrown players and four more club-trained players who were also Italian-born. The new regulations define ‘homegrown’ players as those who spent at least three years between the ages of 15 and 21 at an Italian club, whether in the youth sector or first-team squad, or even away on loan so long as an Italian club still holds the player's contract. The ‘club-trained’ rule refers to a player who spent three of those formative years with the team currently holding their registration. While the first definition is commonplace – Premier League clubs are required to have eight such players in their squads – the second goes beyond those rules. As things stood when the rules were announced, only eight teams – Atalanta, Cagliari, Empoli, Genoa, Juventus, Milan, Roma and Sampdoria – would meet those regulations. The German football reforms post 2000 were far more radical than this. The German FA wanted to stamp its own authority and stopped relying on clubs to produce talent. Rather, they intervened, and made German football what it is today. Those reforms, post the Euro 2000 German embarrassment included changes within the ownership structure, where it was made mandatory for clubs to be owned more than half by the fans. It also mandated clubs to have a set academy structure, and the the German FA now boasts of the largest number of qualified coaches anywhere in the world as well. Robin Dutt, the new director responsible for youth development in the German FA smiles at the fact that other countries are now looking enviously at the German model, whereas Germany were doing the same thing around 15 years ago. The success is represented now in the fact that the national team is now blessed with a huge amount of talent, coupled with a generation that has already displayed its flamboyant best at the 2014 FIFA World Cup. Coming to the most important point, which is the applicability of these reforms. The German model of fan ownership should be taken with a pinch of salt, where, many clubs complain of not being competitive enough and not being the able to strike the right balance between corporates and fans. Some clubs have fans with huge spending capacities, while others simply don’t have that sort of medium to become giants of world football. Scottish football, after the mismanagement of Rangers, sought to introduce a system of fan ownership. So did Wrexham and Portsmouth within England, and it has so far worked pretty well for those clubs, a far cry from their turbulent days of senseless club owners. Also, the fact of the matter is that there is a lack of qualified coaches, and many academies do not meet basic infrastrucure needs, and there is a lack of investment with some erratic owners coming into the Premier League in the recent past. The methods that these owners use are far from enough, they only serve to fill the club’s pockets, be it any which way. The fan ownership is an apt model to counter the monopoly of the owners, and make any club move in a desirable direction. English football needs to take a hard look at itself, and look at where it is going wrong. The potential, the money, the fan base is all there, and won’t go away. It is how those aspects are utilized. England needs to move away from over-hyped, over-paid English stars, and move to a generation of footballers which actually fulfills its potential.